In the world of the spy, nothing is as it seems. Your closest friends are your enemies; every plot has a hidden agenda; fact is stranger than rumor, and no one can be trusted. Anyone who enters the deadly world of espionage must have the sharpest wits, the best equipment, and the most complete information. Only the truly brave and cunning will live to see their next mission . . . Welcome to the world of spies and counterspies, codes and ciphers, ruthless subversion and desperate heroism. 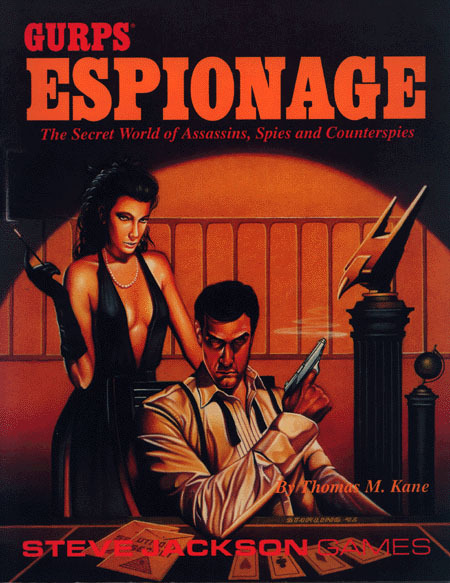 GURPS Espionage covers both the high-tech world of the cinematic super-spy and the gritty adventures of the real-life secret agent. Includes gadgets, a comprehensive list of real-world agencies, and a glossary of spy talk. GURPS Covert Ops – Assassins, saboteurs, and terrorists have been with us all through history. Sometimes their deeds have changed the course of history. If you want to change history – or stop those who would – then this is the book you're looking for.